San Diego’s North Shore Ups the Ante on Coastal Fun. Next, head two blocks west to Wheel Fun rentals located beneath the pier. rent bikes and cruise along the strand, harbor or seven-mile san luis rey bike trail. if you prefer to be on the water, Oceanside’s picturesque harbor is the perfect place to rent kayaks or stand Up Paddle boards. When it is time for lunch, the new Oceanside Broiler at the harbor serves up savory burgers, fresh seafood and tasty salads—all with gorgeous views of the water. Or, grab a seat downtown at the hip new Hello Betty Fish House where you’ll enjoy unobstructed ocean views, a Baja-inspired menu and expansive beverage offerings including specialty cocktails such as Maverick’s Squeeze and Beach Break Therapy, which capture the town’s unique coastal personality. For a fun souvenir from your outing, check out Succulent Café where you can pick up one of owner Peter Loyola’s artistic succulent arrange- ments that incorporate seashells, driftwood and other unique items. Or, venture down to South O and treasure hunt at one-of-a-kind vintage consignment shops. Visitors looking for thrills may want to stop off at Oceanside Municipal Airport for a breathtaking view of the sunset from the clouds. Tsunami Skydivers offers the only coastal skydiving in the region and Coastal Aero Scenic dazzles guests with aerial tours of the coastline in a vintage 1941 Waco biplane. Cap off your fun day at one of Oceanside’s many new restaurants and trendy watering holes. 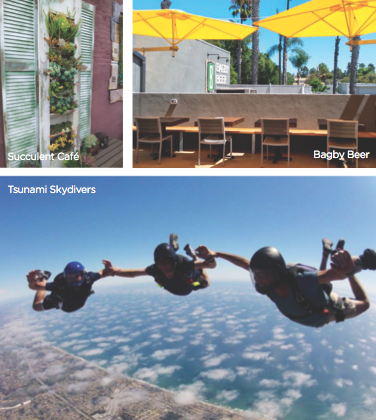 Bagby Beer is the latest edition to the city’s growing craft beer scene and features two stories, an ocean view deck, outdoor patios and signature beers (brewed on site) from Jeff Bagby, one of the area’s most decorated brew masters. Just up the road on Coast Highway, Local Tap House & Kitchen and Master’s Kitchen & Cocktails are two new restaurants serving up creative cuisine and a large selection of craft beer and seasonal beverages. A day trip to Oceanside is the perfect way to create lasting memories with friends, family and loved ones. For more information or to plan your visit, go to www.visitoceanside.org. First, stop for a morning jolt and divine pastries is downtown’s Petite Madeline bakery and Café. locally owned and operated, the shop enjoys a central location on Coast highway and Pier view Way and delights locals and visitors with premium coffee and delicacies made from scratch using high-quality, natural ingredients. after fueling up, wander across the street for a lesson in surf culture at the California surf Museum. 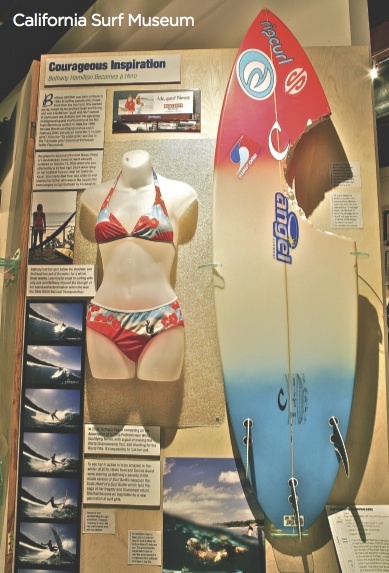 From wood plank surfboards made in the early 1900s to bethany hamilton’s shark-bitten board from 2003, the museum actively preserves surf-related items while telling their compelling stories.